Actually, until the moment he asked us that question, we hadn’t been aware of the existence of this particular map. Truth be told, it hadn’t been all that long that we’d even been aware of the existence of the Hispanic Society of America in New York City, which is where we were. The real reason we had taken the subway up to the Washington Heights neighborhood on the northern end of Manhattan was to see some large-format paintings by the Spanish artist Joaquin Sorolla. Somehow I had stumbled onto the information that the Hispanic Society had commissioned Sorolla to produce these works early in the twentieth century. We like Sorolla’s paintings, so we thought we’d go check them out. By the way, the Hispanic Society of America was the brainchild, if that’s the word, of a man named Archer Huntington, the heir to a railroad fortune. He had envisioned this project as a museum and reference library devoted to the arts and culture of Spain, Portugal and Latin America. “All right, if you’ll follow me,” the librarian said, and took us into a reading room. It was occupied by two or three researchers sitting at wooden tables; they were studying historical documents and stealing an occasional glance at us, trying to figure out, I suppose, what the heck these two tourists were doing there. The librarian indicated where we should stand. He then raised a cloth curtain that was protecting the map. One thing we could tell right away was that the map was very, very old. In fact, it had been made in 1526 by Juan Vespucci, the nephew of Amerigo Vespucci, and depicted the known world at a time when a lot of the world still wasn’t known. For instance, North America (Amerigo’s namesake), ended at about the Mississippi River, and Vespucci had depicted a giant Spanish galleon in the middle of an imaginary ocean which we now know is the left side of the South American continent. 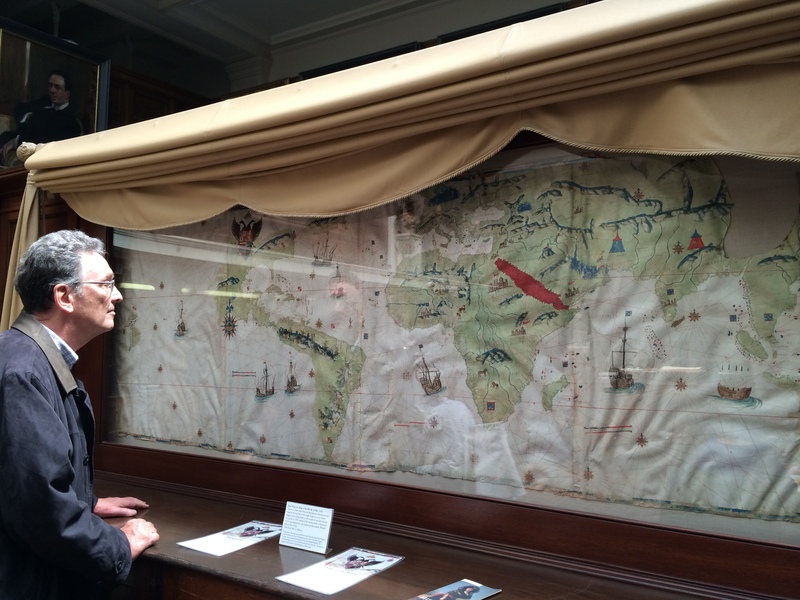 Still, it was pretty cool to be standing in front of a map that is almost five hundred years old. There’s a vivid splash of red in the map; I leaned in to see what it was. Evidently Vespucci was a cartographer with a sense of humor: the red streak was the Red Sea. We took our time looking at the map, thanked the librarian, and wandered into other rooms. We found the Sorolla murals that had drawn us here, and all by themselves they would have been worth the trip from midtown up to Broadway and 155th. But the Hispanic Society of America also has a gallery with paintings by Goya, El Greco, Diego Velázquez, Ribera, Francisco de Zurbarán and other notables. There were literally millions of dollars’ worth of paintings being displayed rather casually, I thought. But they probably aren’t at much risk, since it seems that hardly anyone knows they’re there. That’s the fun of taking these little off-the-beaten-path adventures. They don’t always reward you, but sometimes — as in this case — you get lucky. That clarification seemed unnecessary, but a hundred years ago it would have been possible to put an original Van Gogh over one’s kitchen sink. Critics and art dealers didn’t decide his work was worth owning until the early 20th century, so Vincent missed out on the lavish acclaim that has been heaped on his work since. There have been other artists — Paul Cezanne, just to name one — for whom success also came posthumously. On the other hand, there are painters who were widely admired during their lifetimes, but were consigned to obscurity afterward. You may be familiar with the work of an 18th-century genre and still-life painter named Jean-Baptiste Siméon Chardin, who was King Louis XV’s favorite artist. Chardin has been forgotten and then rediscovered a couple of times, most recently in the mid-20th century. In case you’re keeping score, he is currently considered a genius. An artist whose work I recently stumbled upon (and they should be more careful about putting stuff where you can stumble on it) is a Spanish painter named Joaquin Sorolla y Bastida. He is more commonly known as Joaquin Sorolla — but it may be stretching a point to say that he is “commonly known”. Have you ever heard of Sorolla? Until a year or so ago I hadn’t, but our friend Susie tipped us off before a visit to Madrid, where he still seems to have a following. An orphan at the age of two, Sorolla showed early promise as an artist and by his late 20s — in the 1890s — he was receiving international acclaim. In the early 20th century, exhibitions of his work were garnering praise and generating commissions, including a portrait of the U.S. president, William Howard Taft, that was painted in the White House. Sorolla’s portraits have a lot of charm, but he was equally adept at landscape and genre painting. There was a lot of sunshine in his palette, and my favorite works by Sorolla are scenes at the edge of the ocean, many painted on the beach at Valencia. 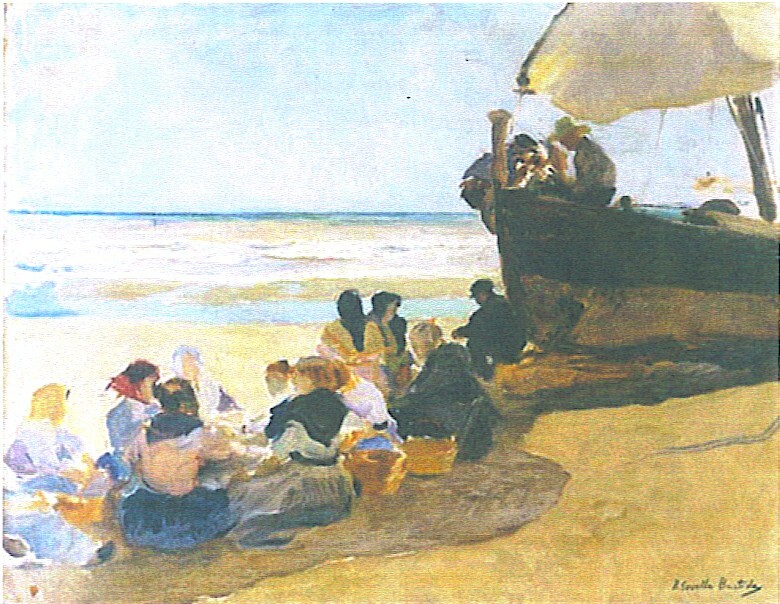 Sorolla’s style might be characterized as somewhere between Realism and Impressionism, more loosely rendered than the paintings of his friend John Singer Sargent, whose reputation has lasted longer. Soon after Sorolla’s death in 1923, his fame began to decline. In the art world, immortality doesn’t always last forever. It’s probably not a coincidence that Van Gogh’s reputation soared around the same time that Sorolla’s receded, because critics and the public were chasing after the next new thing, which at that time was Post-Impressionism. It doesn’t seem likely that Van Gogh’s fame will vanish, since there are so many reproductions of his work over kitchen sinks. It would be nice, though, if the world rediscovers Joaquin Sorolla — that guy could paint.